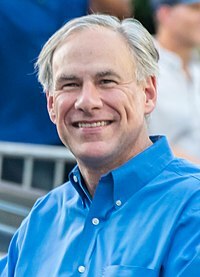 The Governor of Texas (Spanish: Gobernador de Texas) is the head of the executive branch of Texas's government and the commander-in-chief of the state's military forces. The governor has the power to either approve or veto bills passed by the Texas Legislature, and to convene the legislature. The governor may grant pardons in cases other than impeachment (but only when recommended by the Board of Pardons and Paroles) or in the case of treason, with permission by the legislature. The current Governor is Greg Abbott. The state's first constitution in 1845 established the office of governor, to serve for two years, but no more than four years out of every six (essentially a limit of no more than two consecutive terms). The 1861 secessionist constitution set the term start date at the first Monday in the November following the election. The 1866 constitution, adopted just after the American Civil War, increased terms to 4 years, but no more than 8 years out of every 12, and moved the start date to the first Thursday after the organization of the legislature, or "as soon thereafter as practicable". The Reconstruction constitution of 1869 removed the limit on terms, Texas remains one of 14 states with no gubernatorial term limit. The present constitution of 1876 shortened terms back to two years, but a 1972 amendment increased it again to four years. The gubernatorial election is held every four years on the first Tuesday after the first Monday in November and does not coincide with the presidential elections. The governor is sworn in on the third Tuesday of January every four years along with the lieutenant governor, so Abbott and current Lieutenant Governor Dan Patrick both took office on January 20, 2015. Despite the lack of term limits, no Texas governor in the 19th or 20th centuries ever served more than seven and a half consecutive years in office (Allan Shivers) or eight years total service (Bill Clements, in two non-consecutive four-year terms). Former Governor Rick Perry, who served from 2000 to 2015, has now surpassed both these records, becoming the first Texas governor to serve three consecutive four-year terms. When Perry won the general election on November 2, 2010, he joined Shivers, Price Daniel, and John Connally as the only Texas governors elected to three terms (the terms served by Governors Shivers, Daniel, and Connally were 2 year terms). In case of a vacancy in the office of governor, the lieutenant governor becomes governor. This rule was added only in a 1999 amendment, prior to which the lieutenant governor only acted as governor, except during the time of the 1861 constitution, which said that the lieutenant governor would be styled "Governor of the State of Texas" in case of vacancy. ^ Texas Politics - The Executive Branch Archived 2009-02-11 at the Wayback Machine. Texaspolitics.laits.utexas.edu. Retrieved on 2013-07-15.